RALEIGH, NC (WTVD) -- As the debate about the future of Confederate monuments rages on from college campuses to the state Legislature, organizers behind the North Carolina Freedom Park are hopeful the renewed attention will increase their funding. "The time is not only right, it's past time," said Reginald Hildebrand, a board member with the North Carolina Freedom Park. 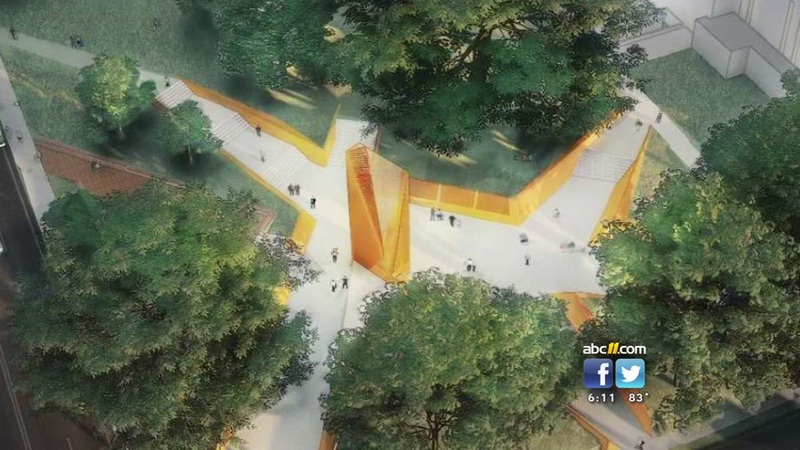 In renderings provided to ABC11, they hope the space will highlight African-American freedom and contributions to North Carolina. It is set to include walkways with quotes from black educators, scholars, poets, and other significant figures, as well as an LED video board with educational material. Organizers said the quotes will be focused on freedom, equality, equity, and opportunity. "What we hope will happen is when people - who recognize that whatever their background is - the struggle of those people is their struggle. That it's the struggle of North Carolina. It's the struggle of anyone who believes in the value of freedom," Hildebrand said. So far, the project has raised about $1.1 million, nearly a third of the initial goal of $3.5 million. A downtown Raleigh park honoring African American heritage and contributions to North Carolina is one step closer to becoming a reality. "We are hoping to go to the Legislature to maybe finish it up. I spoke with the Legislative leaders, and they're amenable," said David Warren, the co-chair of North Carolina Freedom Park. Warren also touted the support of Gov. Roy Cooper, as well as multiple former governors in moving the project forward. "We're honoring both the sung and unsung heroes of the development of North Carolina by African-Americans going way back. So it's going to be more of an abstract park," Warren explained. Last week, a task force appointed by Cooper recommended against relocating three Confederate monuments from the State Capitol, while also urging adding plaques and memorials honoring African-Americans. Organizers are also supportive of the North Carolina Department of Natural and Cultural Resources project to add statues of black American heroes on the Capitol Grounds. "A fresh attention paid to the significance to what we've been trying to do, a statement that we've been trying to make for several years about the significance about the inclusive struggle for freedom being symbolized by public art," Hildebrand said, and he noted that Freedom Park had been in the works before these discussions. The proposed site is at Wilmington and Lane Streets in downtown Raleigh, a block from the Legislative Building. Their goal is to break ground on the project in February, which is Black History Month. They hope to have the project completed in 2020. "We in the 21st century have, I think, have an obligation to posterity," Hildebrand said. "As other generations have done, to establish monuments, statues, make some sort of statements with public art, public grounds that say who we are and what we believe. The legacy we want to pass on to future generations. There's a statement we can make in the 21st century that would have been impossible in the 1800s, an inclusive statement." A local architect is calling for calm as the debate over Confederate monuments has led to upheaval. The project is being headed up by world-renowned architect Phil Freelon, who led the design team for the Smithsonian Institution National Museum of African American History and Culture. His work has also been featured prominently elsewhere across the country. To learn more about North Carolina Freedom Park, and how you can donate, click here.